It's not portable because you need to plug it into the wall. Well, you naysayers are wrong! Wrong wrong wrong! 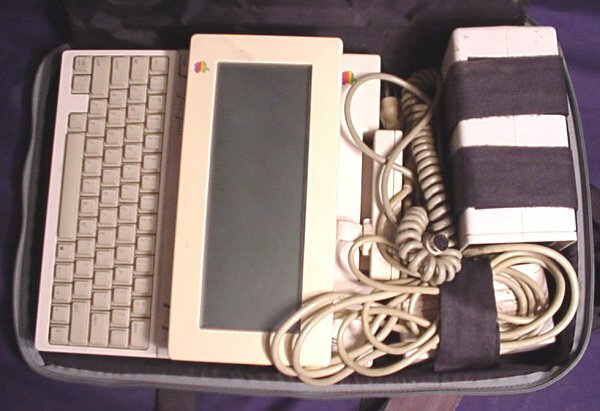 Here's a portable Apple IIc system, with a battery pack for use when away from a wall socket, and with the legendary LCD screen. That's right, the screen exists! 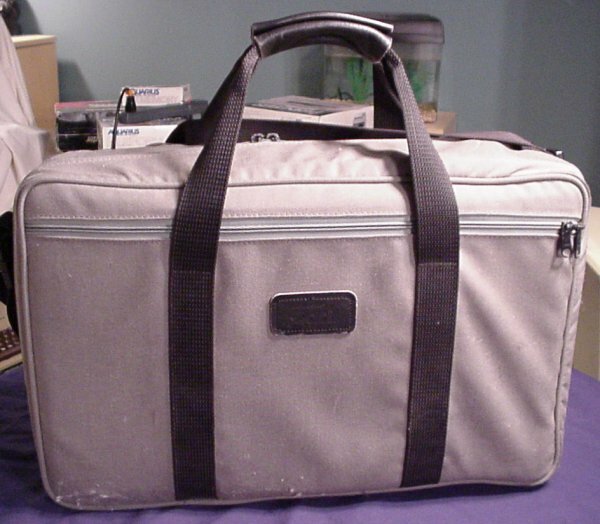 Now, granted, the whole setup is heavy, but luckily comes with a custom shoulder bag to help you heft it around. The LCD screen isn't the sharpest, and its contrast leaves much to be desired. But it does work! 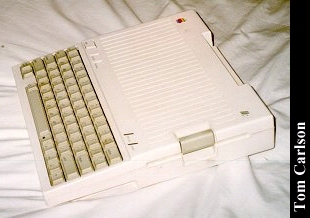 Side shot of the LCD panel perched on the Apple IIc. 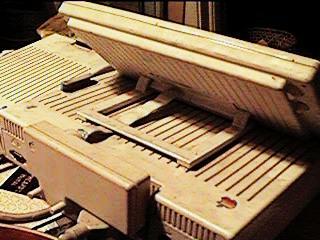 It had little ridges on the bottom that mate into the grooves on the top of the Apple IIc. Backside of the panel. 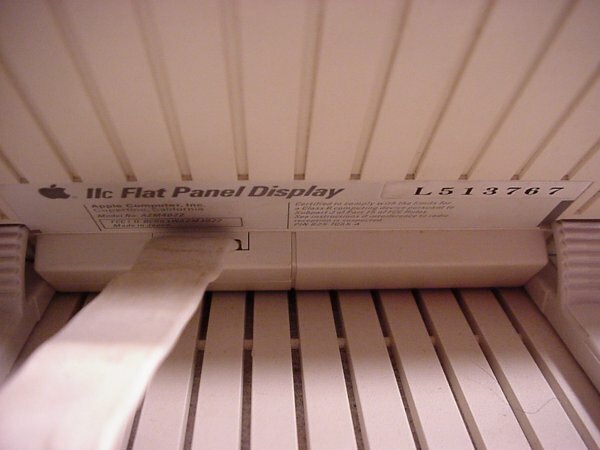 The panel has a folding support on the back, to hold it at a variable angle. Screen shot. 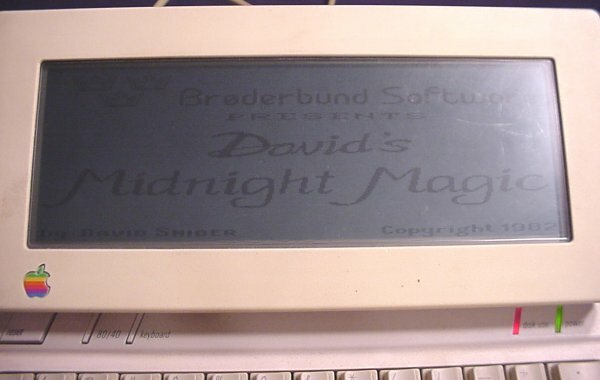 Hey, it's Dave's Midnight Magic. A great game! Panel label. Just to prove it really is a piece of Apple hardware. Battery pack. 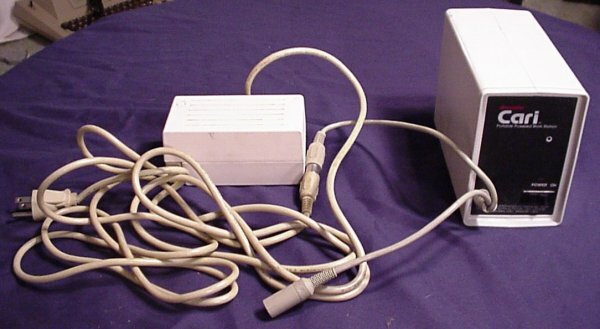 The battery plugs into the standard Apple IIc power supply to get charged up. 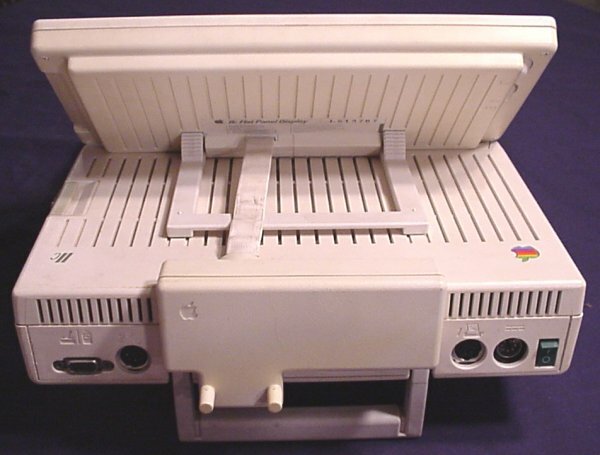 Then it just plugs right into the power port on the Apple IIc. I have no idea how long it will hold a charge, if at all. I also have to admit that the battery isn't Apple equipment. Top view of case. So, how do you carry all this hardware. Why with this soft-sided carrying case, of course. Everything fits, barely. 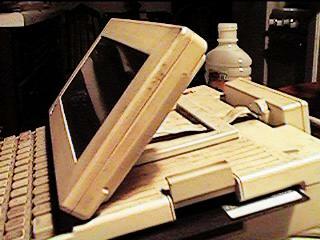 Side view of the case. Case closed. All set to take Apple computing power anywhere, even to the beach in 2010. 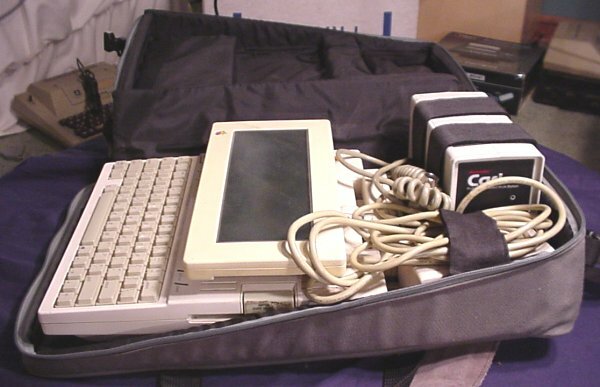 The Apple //c was Apple's portable version of the Apple II series. It's most obvious feature was its small size. 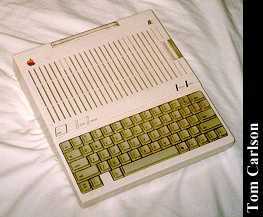 It also has a membrane under the keyboard which protected the guts from spills of the liquid variety. The movie 2010 showed a guy using one at the beach. I don't think these had any sort of battery available, so he must have had a long cord. It used a separate monochrome monitor. It was fairly small and had a special stand that sort of wrapped around the back of the unit, so that the monitor hovered over the case, rather than behind it. Also available were a color monitor, and a special LCD monitor. (Anyone ever seen the LCD monitor?) 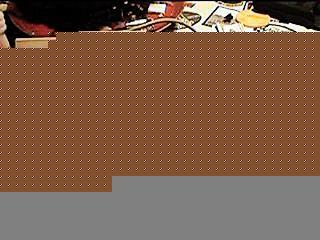 The back has outputs for this monitor, as well as composite video. It could also produce an RF signal using an included adapter. 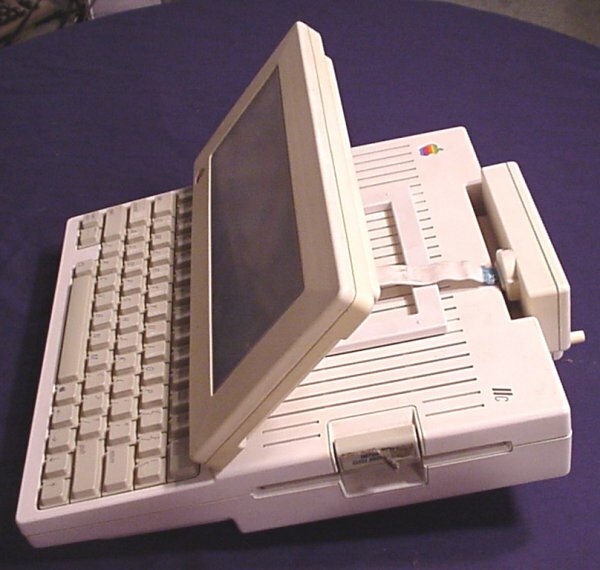 It came standard with a 5¼" floppy drive. Close-up of label on the underside. Here are some pictures of and information about the LCD monitor, courtesy of Neal Pritchett. I have an old Apple IIc with the LCD display and just thought you might be interested in seeing it. The display itself is black and white only (heavens!!) and is adjustable. 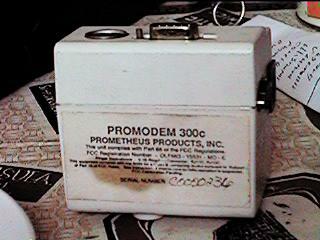 I also have a Prometheus Promodem, which is a small white box that goes into the back of the computer and is a 300 baud(!!) modem. 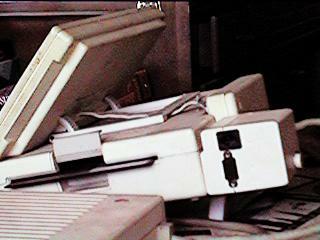 This system was pretty much state of the art when I got it, and I spent many happy hours computing. 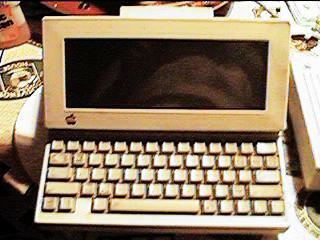 The little beast was a constant companion on my sailboat, and even now I do some of my word processing on it. If only I could find a way to transfer my appleworks wp files onto my PC and into Word. 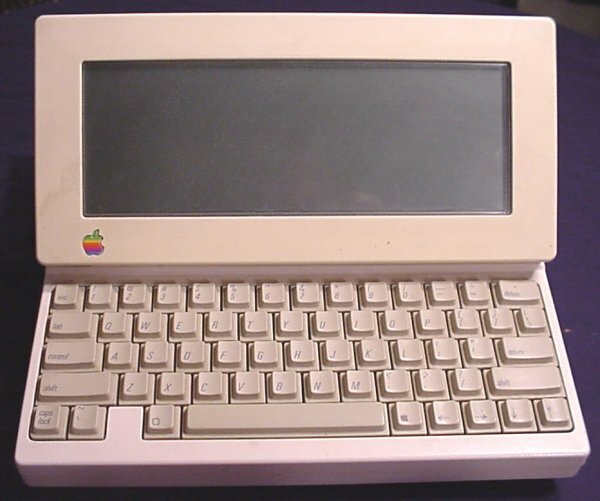 Click here to view all comments for the Apple IIc and to leave your own.